Have you been thinking about making the move to training management software to help run your training business? This eBook is here to hopefully push you to see that training management software could be the answer to all your training administration problems! Read on for all our tips to make the most of implementing and owning training management software. If you’re thinking of implementing training management software in your organisation, we show you how much time and money you could be saving if you do decide to make the move. What should you be looking for in a new training management system? We tell you the 8 features that you need to look for to make sure you make the correct choice. How to do begin to start the research process of purchasing new software? It’s vital you consider these 4 questions before you make a final decision. Having a workforce that is split over different locations can create a whole host of problems, but training management software doesn’t have to be one of them! If you’re considering training management software, have you looked into the benefits of a cloud-based system? Choosing cloud-based software could come with more unexpected benefits to make your company run even smoother. Extra expenditure is never seen as a good thing for any business, but we’re here to show you all the ways training management software can save you lots of money, and easily cover the cost of any outgoings. Cloud-based training management software is great for delivering better training to your customers, but you can also use it to track your internal training as well! Training management software can do a lot more than just help you manage your training administration – it can also help increase your course sales! Making sure you implement new software correctly is a vital step in bringing a new system into your business, and we show you how to make the process easy, even on a global scale! Are you a smaller business looking for training management software? Here are the advantages specific to your type of business. There are so many things you can do with a training management platform, and marketing your courses is just one of them! If you’re shopping around for training management software, we’ve got some tips to make sure you pick the right one, and implement it properly as well! So your business wans to purchase a training management system – what now? We take you through everything you need to do to purchase the perfect system and implement it properly. Training management software is a must-have for organizations that need to deploy online training for their distributed workforce. 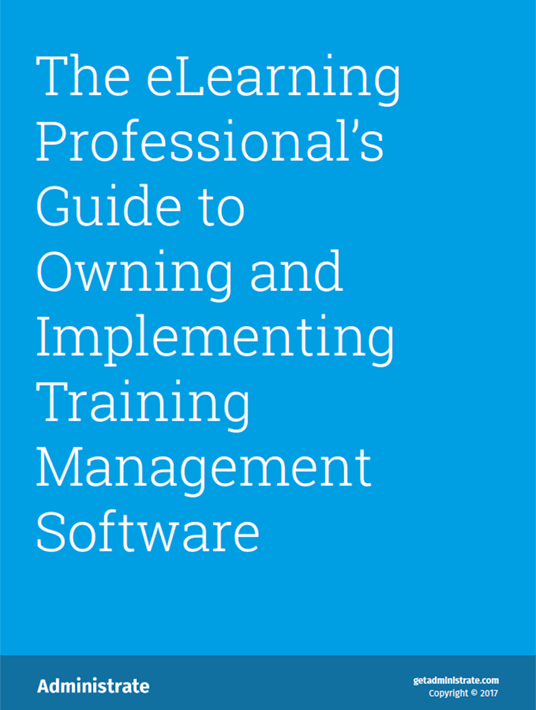 The eLearning Professional’s Guide to Owning and Implementing Training Management Software, provides you with all the guidance you need to choose and implement the right software whether you run a large or a small to medium-sized business, along with extra tips to market your online training course and track online training effectiveness.